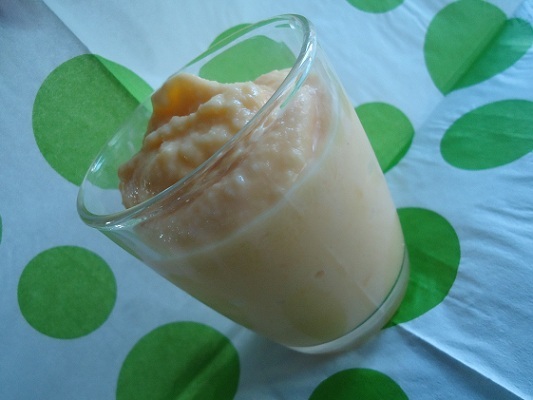 This Pineapple Mango Smoothie is more refreshing that you can imagine. Mmmm! We were on our way home from Kansas City after a weekend event our boys had participated in. The event had been awesome, our boys had done great, and we were all flying high. Except for Asa (our 15 year old) and me. It appeared that the two of us were coming down with the flu. Our throats hurt, our chests burned, and we both began to get feverish. Our eyes were red and achy. Our heads pounded. Matt, bless his heart, was determined to find his feverish bride a smoothie. We finally managed to find a place that had some decent options (without too many funky, sugary ingredients). 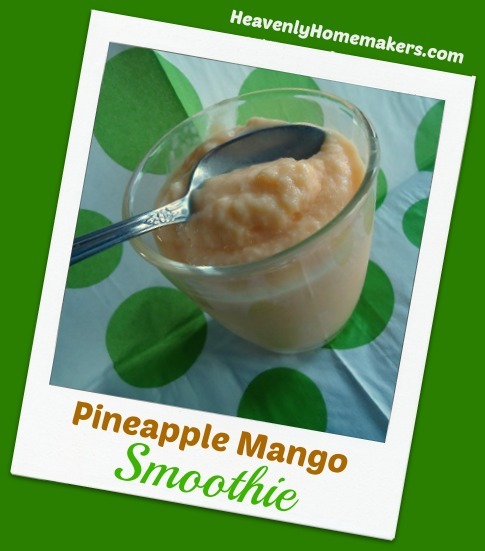 I chose a pineapple mango variety and aside from the fact that it was cold and made my chills just a little bit more miserable – I had never enjoyed a smoothie more. It was so refreshing. It was just what Asa and I needed. We slept the rest of the way home. Asa and I are all better now. In fact, this all happened a couple of months ago. But ever since, I’ve been craving a Pineapple Mango Smoothie. I typically make my smoothies with berries – which we love. But the refreshment that comes from pineapple, mango, and orange juice all blended up in a glass? I knew I needed to recreate this treasure. 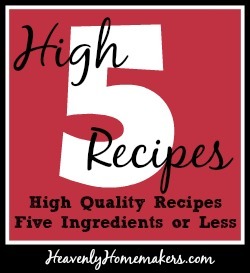 It’s not hard to make – you just need five simple ingredients. Add a little maple syrup or stevia if it’s not sweet enough for you. We think it’s sweet enough as is. Coconut milk makes it taste great and offers a dairy free option if you need it. We like it with plain, whole milk yogurt. I think I may make these every single day this summer. Place all ingredients into a blender or food processor together. What’s your favorite fruit smoothie combination? For the record, I don’t recommend getting the flu before trying this. It’s much more fun to eat when you can hold your head up off the pillow. This sounds odd, but have you ever put oatmeal in a smoothy. We have started putting oats into our kids popsicles and it really seems to make them more filling and more like a meal and surprisingly still refreshing. We love smoothies in our house and make them almost everyday during the summer months. I use many of the same ingredients you use including the coconut milk. Some frozen strawberries are also great. We usually throw in some fresh spinach as well, which may look strange, but it boosts the nutrition and it tastes great. YUM! I can’t wait to try this after the kids are home from school. I love smoothies with mango and pineapple. I go a bit further and throw in a handful of spinach and/or parsley. It’s green colored then, but it still tastes great. Sometimes I add yogurt too. Plain Greek yogurt, frozen mixed berries, half a banana, frozen peach slices, a splash of milk or juice, and a couple ice cubes. If I leave out the banana I use a drizzle of honey. I wish I liked mangoes, but I think they taste like pine needles! Haha, I’ve tried it but then I just keep tasting pine the whole time! Same thing with mango salsa. I’m on a gluten/sugar free diet right now, and have been making what I call tropical smoothies. I use plain yogurt,a little pineapple juice, frozen mango and pineapple, a scoop of protein powder, and about a tablespoon of coconut oil. Sometimes I throw in some kale or spinach as well. I like the slight hint of coconut flavor from the oil. Try a drop of orange essential oil in that. You will not regret it! That sounds like an interesting twist! ave fresh available, i used unsweetened Canned pineapple. I love that my husband loved this green smoothie and my 2 year old kept saying mommy i want a green smoothie! Thanks Laura! Made this today- WOW! It’s like a day at the beach in a cup! We found we have food sensitivities to dairy, gluten, and eggs and I even have one to pineapple- crazy! So we’ve been enjoying lots of berry-spinach smoothies lately as we are on a 3 month cleanse. I omitted the pineapple, used whole oranges instead of juice (because that’s what I had and my Ninja can handle it), and added a little maple syrup and coconut. Thank you for this great idea and another option for us!